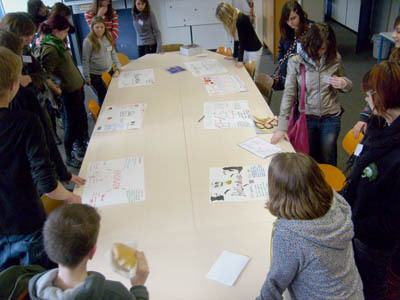 During the first project meeting at Mülheim, Germany in February 2009, we had a joint students' workshop on the festival of Hallowe'en. In some European countries, this festival is relatively new or is not celebrated at all, so it was worth looking at Hallowe'en as a new tradition that only appeals to young people. Hallowe'en is on 30 October, the day before All Saints' Day. People dress up as sppoky figures like ghosts. Children go trick or treating. Houses are decorated on the theme of Hallowe'en. We dress up in scary costumes. It is also a tradition to go trick or treating. The treats are usually candy. We carve pumpkins and decorate our house to look scary. We play games like apple bobbing (in which you get apples out of a bowl of water, using just your mouth). You also hang doughnuts from strings and use your mouth to get them down. Sometimes we tell ghost stories and wrap people up like mummies. The festival is not very popular, only with younger people. Some dress up in crazy costumes and decorate their houses. In the evening people celebrate parties and go out and knock on the doors to get sweets. Teenagers have started to throw eggs and stick toilet paper on cars. In the night we watch scary movies so we can't sleep any more. In Italy adults and older teens don't take part in the celebrations. The younger ones usually organize horror parties or watch horror movies. Small kids go around the city and do trick or treating; afterwards they eat the sweets and the candy. We began to celebrate Hallowe'en three years ago. Chrildren go around the town and people give them sweets. Teenagers meet in homes to have a party and have dinner together, play funny games and watch horror films. For teenagers, a good party is most important there. In our country not a lot of people celebrate Hallowe'en. Children dress up and go trick or treating or have a party and watch horror movies. There are also some happenings at school. But All Saints' Day is more important than Hallowe'en and celebrated to a greater degree. Some of the people dress up in costumes; everyone has a different one. In the evening some people go out to knock on doors and do trick or treating. Then they take the sweets home. "I think Halloween is funny because you can have lots of fun with your friends ... I don't like that much festivals like Easter ... it's totally childlike when you have to search eggs and sweets." "I know ‘Halloween’ where the kids go around the block and say: ‘Trick or Treat’. They want to have a lot of sweets. At this evening you can watch horror films. But my family and me, we don’t celebrate it, because we aren’t interested in it. We think it is not an important festival." 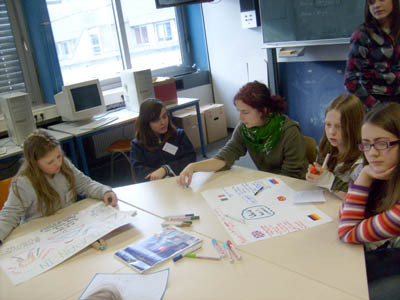 L & L (girls), Mülheim. 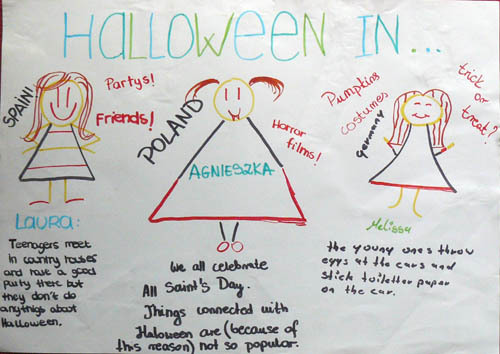 "In Poland only some families celebrate Halloween, it's not a tradition in my country. St. Valentine's Day is just the same. Polish people don't like festivals of that kind, because they mostly appreciate traditional ones like Christmas or Easter."